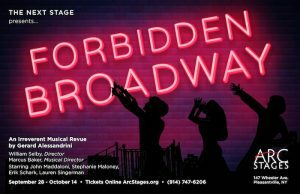 Just when Broadway thought it was safe from the poison pen of funny-man Gerard Alessandrini, Forbidden Broadway is back, this time at Arc Stages! The uproarious musical roast of Broadway that has picked up 9 Drama Desk Awards, a Special Tony®, an Obie, a Lucille Lortel and Drama League Award, features outrageous costumes, hilarious rewrites of the songs you know, and dead-on impressions by a stellar cast! Whether you’re a seasoned theatergoer or new to Broadway, Forbidden Broadway is your one-stop ticket to non-stop laughs. Forbidden Broadway will be directed by William Selby, feature Marcus Baker on the piano, and star John Maddaloni*, Stephanie Maloney*, Erik Schark*, & Lauren Singerman*.